It’s been a while since you’ve spent the day with your family or had a night out with friends. Where should you go? The decision is simple. Choose a classic, American Tavern. With a fun and casual atmosphere, you can grab a bite to eat, sip on some drinks and enjoy each other’s company. Learn everything you need to know about the tavern experience and start planning your next adventure! Classic American taverns are local eateries & pour houses known for their good food and drinks and fun environment. How is a Tavern Different from a Bar? Taverns are more focused on food and family. Some taverns offer specials such as Kids Eat Free Night and family events such as Easter activities. When is the Best Time to go to a Tavern? The best time to go to a tavern typically can be anytime throughout the day. People often visit for brunch, lunch and dinner. The menu at most taverns include various entrees and items. What Type of Food can you Order at a Tavern? The options are endless at most taverns! Choose from a long list of burgers, wings, salads, sandwiches, full entrees, steak, pasta, and more. What type of Drinks can you Order at a Tavern? Local beer, cocktails, high-end whiskeys, bourbons, nitro beers, ciders, wine, and more are often found on a tavern’s drink menu. Some taverns, such as McCray’s in Smyrna offers half off on bottles of wine on Tuesdays for a select wine of the month. Fitting into tavern culture is easy! Taverns are casual, friendly, and welcome places. Everyone enjoys a neighborhood bar where you feel right at home and people know your name. What Clothes to Wear to a Tavern? Although you can dress nice if you want, most people wear casual clothes at taverns. The key is to be comfortable! What are the Best Tavern Drinks? Most people order local beer and cocktails at happy hour or participate in beer of the month specials. What are Favorite Tavern Foods? Most popular menu items at taverns include Buffalo Chicken Paninis, Mumford Burgers (with pimento cheese and fried jalapenos), Salmon Chopped Salad, Nachos (chicken or steak), and Wings. What comes on a Tavern Burger? Taverns have different burgers to choose from that include items like guacamole, pimento cheese, onion rings, bacon, fried egg, bleu cheese crumbles, and more. What Kind of Music do Taverns Play? Taverns play live acoustic and rock music and have DJs during large events like New Years Eve and Halloween. Some taverns also play indie, or hip and trendy music. Do Taverns have Happy Hours? Most taverns do not have happy hours, but they offer other specials, such as a beer of the month, and more. You can find special offers at tavern events, such as tavern crawls. Tavern crawling is a great way to have fun with your friends! Celebrate a special occasion or night out with friends by drinking local, eating local, and receiving specials, all while supporting small businesses. What Tavern Rewards are Available? Most taverns offer rewards for birthdays, anniversaries, and other special occasions where you can have a free meal and get a free dessert. Ask your local tavern about what rewards you can get! 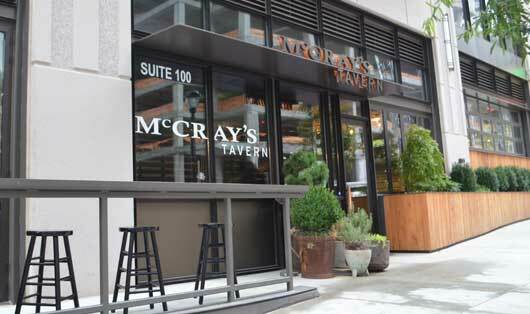 There have been several tavern proposals at McCray’s Tavern Lawrenceville. If you want to do a tavern proposal, contact the management team. They can place roses on your table and provide you with a bottle of champagne. 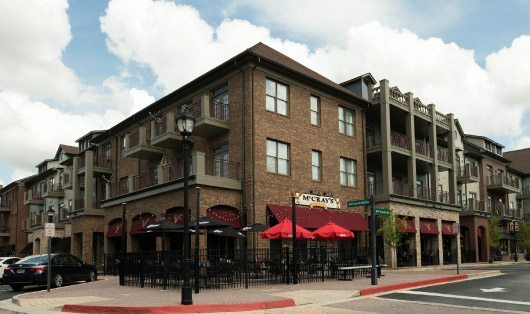 What are the Best Tavern Restaurants in Georgia? 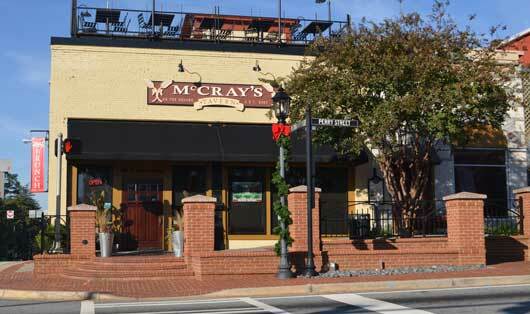 If you are looking for the best tavern experience in the state, visit McCray’s Tavern. With three locations in Midtown, Smyrna, and Lawrenceville your perfect location for a day with family or night out with friends is just a few miles down the road. Choose delicious items from their food and drink menus. You can also order online or host your own private event. Visit the McCray’s Tavern website for more information.